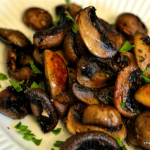 Seared crimini mushrooms enhanced with fresh thyme, garlic and white wine are delicious on their own, on toast or as a side dish for everything from burgers and steak to roast chicken, fish or veal. Heat oil in a large skillet over medium-high until just beginning to smoke. 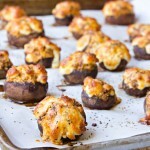 Arrange mushrooms in skillet in a single layer and cook, undisturbed, until bottom side is golden brown, about 3 minutes. 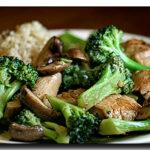 Season with salt and pepper, toss mushrooms, and continue to cook, tossing often and reducing heat as needed to avoid scorching, until golden brown all over, about 5 minutes more. Reduce the heat to medium and add butter, thyme and garlic. 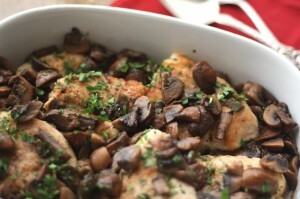 Pour in the wine and simmer until the liquid has evaporated and the mushrooms are tender 2-4 more minutes. Sauté onions in oil over medium heat until golden brown, about 5 minutes. In a large bowl, combine half of the sautéed onions, ground beef, ground turkey, bread crumbs, egg, egg white, ¼ cup beef broth, salt and black pepper. Shape into 8 oval patties. In a large deep skillet over medium-high heat, brown both sides of patties. Set aside on a dish. 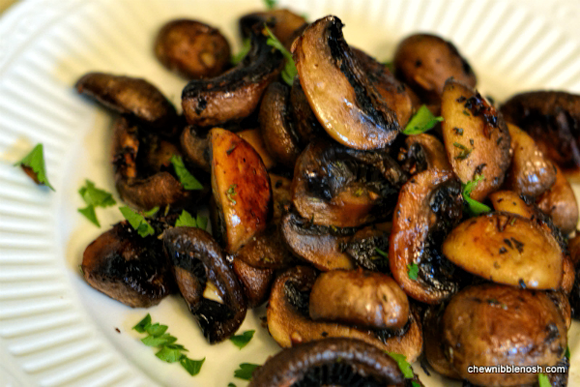 Add mushrooms to the skillet, season with salt and pepper and sauté 2-3 minutes. Return patties to the skillet with the mushrooms. In a small bowl, blend flour and remaining broth until smooth. Mix in remaining onions, tomato paste, vinegar, water, Worcestershire sauce and mustard powder. Cover and cook on low heat for 20 minutes, stirring occasionally. A great & delicious dish for entertaining which can be made ahead then reheated in the oven while you visit with your guests. 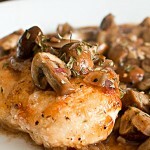 If using chicken breasts, cut crosswise in half. In shallow Dutch oven, heat 1 tbsp (15 mL) of the butter over medium-high heat. Brown chicken, in batches, about 10 minutes. Remove to plate. Drain fat from pan; reduce heat to medium. Add pearl onions and mushrooms; fry until browned, about 5 minutes. Transfer to separate plate. Add remaining butter to pan; fry chopped onions, thyme, salt, pepper and bay leaf until onions are softened, about 8 minutes. Add wine, stock, tomato paste, and Cognac (if using); bring to boil over high heat, stirring and scraping up any brown bits. Return chicken and any accumulated juices to pan. Reduce heat to medium; cover and simmer, stirring occasionally, for 20 minutes. Puff Pastry Stars: On lightly floured surface, roll out pastry to () thickness. Using star-shaped cutters of various sizes, cut out stars. Place on baking sheet; brush with egg. Bake in () oven until golden, about 15 minutes. 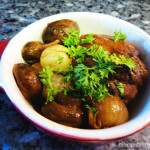 Garnish Coq au Vin with stars. This classic dish is ideal for entertaining since you can sit and sip with guests while the dish simmers. Serve the same type of wine for cooking and drinking. 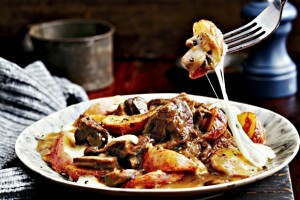 If you prefer a lighter bodied wine and sauce, use a Pinot Noir or Gamay. For robust flavour, choose a Cabernet Sauvignon, a Meritage (or Bordeaux) blend or a grapy Baco Noir. On a parchment-lined baking sheet, form two discs with finely grated Gouda to make tuiles. Bake in the oven until crisp, about 5 minutes. Let cool. Lower oven temperature to 325F (160C). 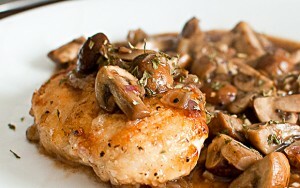 In a skillet over high heat, melt butter and brown turkey cutlets for 2 minutes on each side. 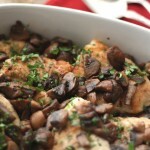 Transfer to an oven-safe baking dish and continue cooking in the oven while preparing the sauce. In the same skillet, brown garlic and mushrooms. De-glaze with white wine, add cream and coarsely grated Gouda. Arrange cutlets on plates and top with sauce. Garnish with arugula and a Gouda Tuile. Grizzly Gouda is made in Alberta you can substitute another Gouda or Parmesan cheese if you like. 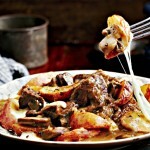 Spoon this chunky, gravy-rich stew over mashed potatoes or noodles for a yummy comfort food dinner. In bowl, pour boiling water over dried mushrooms; set aside. 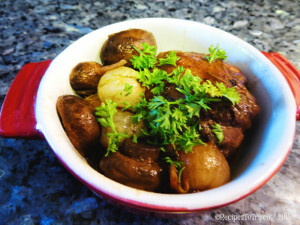 In Dutch oven or heavy-bottomed saucepan, melt 2 tbsp of the butter over medium heat; cook onions, stirring occasionally, until golden, about 25 minutes. Stir in garlic; cook, stirring, for 1 minute. Scrape into separate bowl; set aside. 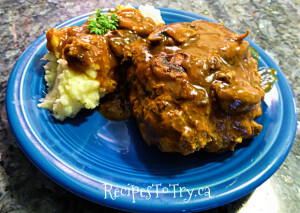 Toss beef with half each of the salt and pepper; toss in 3 tbsp of the flour. In same pan, heat oil over medium-high heat; cook beef, in batches and stirring occasionally, until browned, about 7 minutes. Stir in onion mixture, 3 cups of the broth, 2 cups water, thyme, bay leaves, soaked mushrooms and soaking liquid, and remaining salt and pepper. Bring to boil; reduce heat, cover and simmer just until beef is tender, about 1-1/2 hours. Discard bay leaves; stir in mustard and Worcestershire sauce. Meanwhile, in skillet over medium-high heat, melt remaining butter; cook cremini mushrooms, stirring occasionally, until softened, about 5 minutes. Stir in remaining flour; cook, stirring occasionally, until flour is golden, about 3 minutes. Whisk in remaining broth until smooth. Stir into stew; bring to boil. Reduce heat and simmer, stirring occasionally, until thickened, about 20 minutes. Make ahead: Let cool for 30 minutes. Refrigerate in airtight container for up to 3 days or freeze. Preheat the oven to 400 F (200 C). 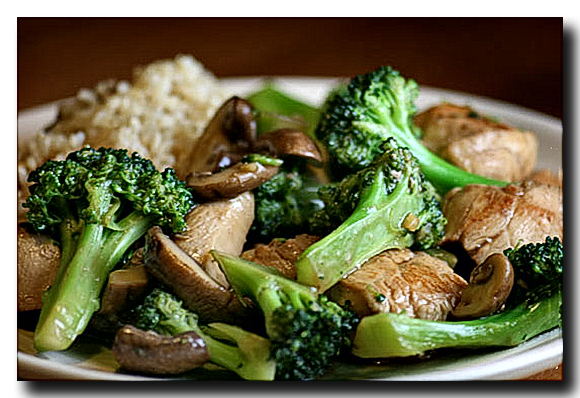 Combine the olive oil, soy sauce, mirin, ginger, and garlic in a small bowl, and mix together well. Season with salt and pepper. 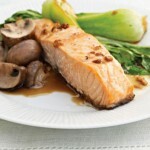 Put the salmon, Bok Choy, and Mushrooms in a roasting pan, then drizzle with the oil mixture and coat well. Put into the oven to roast for 20-25 minutes or until the salmon is cooked through. Serve with rice. For the Cuisinart Convection Steaming Oven place baking pan on middle rack. Put the vegetables in pan with the Bok Choy in the middle and mushrooms on outside. 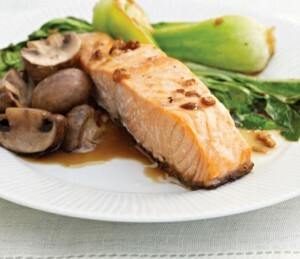 Place the Salmon on top of the Bok Choy. Set Oven to Bake Steam at 450 F for 15 to 20 minutes. If you can't get hold of Mirin (Japanese rice wine), use dry sherry or omit altogether. These little atomic flavor bombs combine all of the best attributes of their ingredients into fabulous one bite wonders. Preheat the oven to 400 degrees F and line a rimmed baking sheet with parchment paper. Pop all the stems off the mushrooms and lay them upside down on the baking sheet. Heat a small skillet to medium-high. Sauté the chorizo, until cooked through. Then place it in a mixing bowl with the cream cheese and thyme. Mix thoroughly, then spoon the chorizo filling into the cavity of each mushroom. 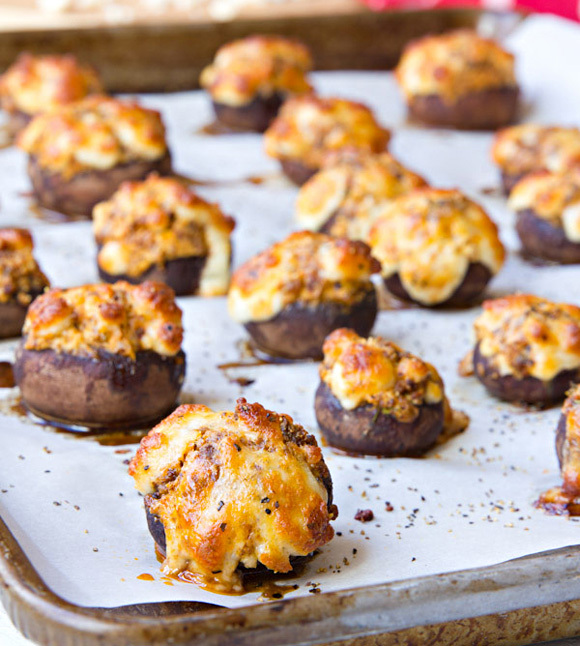 Sprinkle the top of each mushroom with crumbled panela cheese and bake for 18-20 minutes. Until the tops are brown and the mushrooms have cooked through. Serve warm. Panela cheese( Fresh Mexican cheese made from whole unpasteurized milk curds)you can Substitute: Monterey Jack or mozzarella. Chorizo (Spicy pork sausage) you can Substitute: Hot Italian sausage or make your own with ground pork, garlic, cumin and paprika. 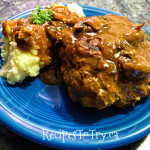 Tasty and smells great while it is cooking in the slow cooker. 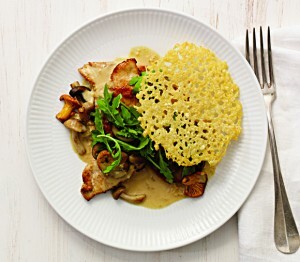 This dish is delicious with garlic–butter-slathered baguette slices and asparagus on the side. In a large bowl, mix together the flour, salt, and 8 grains of pepper. 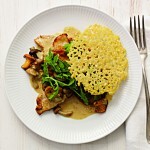 Add the chicken and dredge, coating well and reserving any excess flour. Heat 1 tablespoon each of the butter and oil in a heavy 10 inch sauté pan over medium-high hear. Once the butter has melted, add half of the chicken and cook, turning over halfway through, until lightly golden brown on both sides, about 7 minutes. Transfer to the slow cooker. Repeat with the remaining chicken and oil, about another 5 minutes. Add onion and 1 tablespoon garlic to the pan and sauté until softened, about 4 minutes. Whisk in the reserved flour, the mustard, and tomato paste and cook until the flour disappears, about 1 minute. Take the pan off the heat and add the wine; return the pan to the heat and raise the heat to high. Cook, whisking, for about 2 minutes. Add the stock and honey and simmer for 3 minutes. Pour over the chicken, submerging the meat in the sauce. Cover the slow cooker and cook on low until the chicken is cooked through, about 4 hours. Use a ladle to skim off any fat.